The $250 (as of November 16, 2011) Barnes & Noble Nook Tablet provides solid competition for Amazon's Kindle Fire--and it even outdoes the Kindle Fire on many counts. This is Barnes & Noble's second-generation device, a follow-up to last year's Nook Color, which now drops to $200, the same price as the Kindle Fire. In its interface and its physical design, the Nook Tablet resembles the Nook Color, but it has better specs and some new software integrations. The additions are compelling; and as an e-reader, the Nook Tablet continues to excel. However, when compared against the larger array of available tablet models, the Nook Tablet suffers from some of the same weaknesses that affect the Kindle Fire. Still, the Nook Tablet's low price will make it appealing to fans of both e-readers and tablets. In fact, it's priced low enough to sway some consumers who might have been considering an iPad 2, which has a larger display, but also costs twice as much. Considering the Nook Tablet's competitive price and beefy specs, makers of other so-called "value" tablets (including Amazon, with its Kindle Fire tablet) may find that it poses a serious challenge. Though the Nook Tablet doesn't excel as a tablet, it stays true to its roots as an LCD e-reader that is optimized for reading. That's one area where Amazon's Kindle Fire has tripped up. The Nook Tablet's unique display has less reflectivity than the Kindle Fire's, and so is easier to read. In addition, some fonts and videos render more sharply on it than on the Fire. And the Nook Tablet has another advantage over the Fire in that it carries a MicroSD card slot for extra storage, plus physical volume buttons. Like the Amazon Kindle Fire, the Nook Tablet provides numerous reading options; but the Nook Tablet's screen is far superior. This tablet's beefed-up horsepower--in comparison to the earlier Nook Color e-reader's--really counts. The dual-core 1GHz Texas Instruments OMAP 4 CPU and 1GB of RAM made switching from app to app a breeze, with little lag or stuttering. Movies played smoothly and stutter-free in Netflix, and the high-definition images re-rendered for Nook's 1024-by-600-pixel display looked lovely, with terrific contrast. The Nook Tablet has 16GB of storage on board, but only 1GB is available for user content. For the rest of your media files, you'll need to bring your own MicroSD card (up to 32GB). The Nook Tablet's display was dazzling overall. It's similar to the one on the Nook Color, but Barnes & Noble says that the new display incorporates some improvements from the company's display supplier. Those improvements--and not software enhancements--account for the Nook Tablet's superior handling of whites and browns. In a test image, for example, skin tones and a brown sweater looked far more realistic on the Nook Tablet than on the Nook Color. The screen's glare was minimal, thanks to what Barnes & Noble calls its VividView display. The IPS display is laminated and bonded; so unlike on other tablets' displays--including the Kindle Fire's--there's no annoying, visible air gap between the glass screen and the LCD beneath. That's not to say that glare has completely disappeared on the Nook Tablet, but the difference is obvious in a side-by-side comparison. The VividView display also enhances the contrast and viewing angle of the Nook Tablet versus the Kindle Fire. The difference in the screen is quite evident when you view a Nook Tablet side by side with the Kindle Fire. 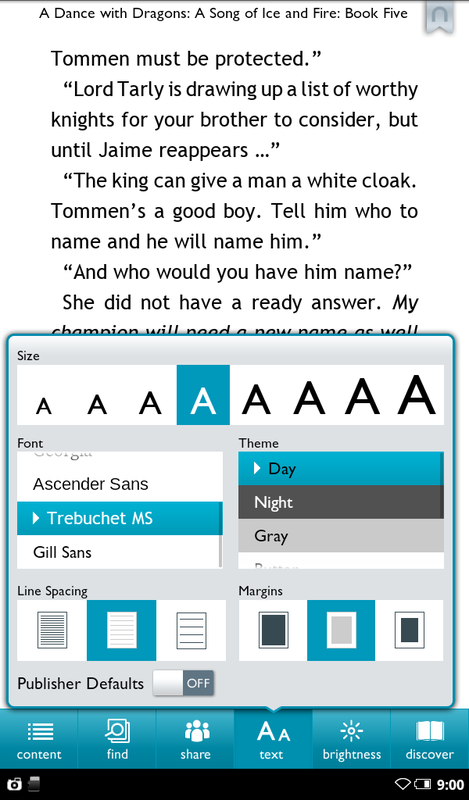 Couple the display with the Nook Tablet's superior font sizes and style choices plus better text rendering, and you have a nicer environment for reading. The tablet felt noticeably lighter than the Nook Color, even though the difference on paper--1.7 ounces--seem negligible. Still, I could feel the difference when holding the tablet in one hand, as I often do when using one. Next to the Kindle Fire, the weight difference is less evident. Only hundredths of a pound separate the two (the Nook Tablet weighs 0.88 pound, whereas the Kindle Fire is 0.91 pound), and their balance feels quite different because of their different dimensions (the Nook Tablet is about 0.67 inch taller than the Kindle Fire). Apps are the lifeblood of any tablet--as can be seen from the thriving 100,000+ strong app ecosystem for the Apple iPad. Android tablets have struggled, though, in part because of the fragmentation caused by different Android OS versions and different screen sizes. Among competing, full-blown 7-inch tablets, the latest models from Acer, Samsung, Toshiba, and leading tablet makers use Google's Android 3.2 Honeycomb operating system, which was optimized for the larger screen sizes of tablets. Other models--particularly those produced by budget-conscious tablet makers--use some version of Android 2.2 or Android 2.3, neither of which was intended for use on tablets. In either case, finding apps that fit a tablet screen and look appropriate on a tablet has been an ongoing issue for Android tablets in general, and especially so for 7-inch tablets based on Android 2.3 Gingerbread. The Nook Tablet Apps library is accessible from within a single library option that's divvied up into books, magazines, newspapers, apps, and more. Barnes & Noble based the Nook Tablet OS on Android 2.3, but the company doesn't include support for the Android Market. Instead, apps are funneled through B&N's own, growing app store. B&N has over 1000 apps at launch, and expects to offer “thousands” by year's end. There is some advantage to consumers in B&N's curated approach. In practice, the contrast to the messy Android Market experience was quite refreshing. I've downloaded plenty of apps from the Android Market onto 7-inch tablets only to have them crash and force-close on me--or not stretch properly to fit the tablet's screen. It was also a pleasant switch from what I saw in the Kindle Fire's Amazon Appstore or in the GetJar storefront of the Kobo Vox. 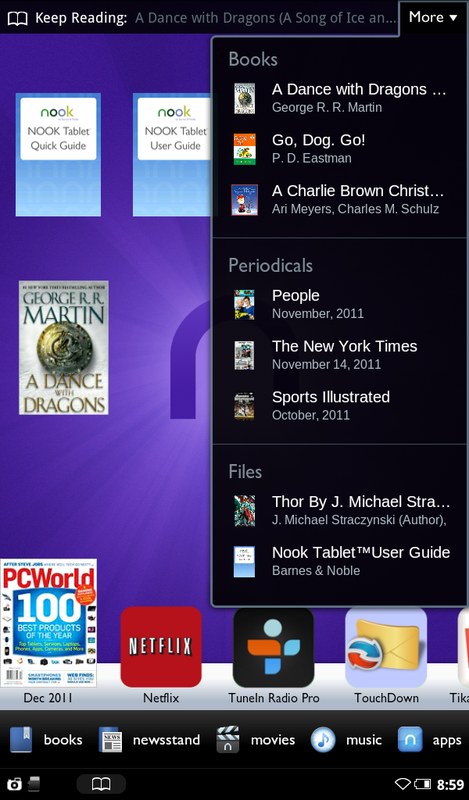 And many of the apps I tried, such as those for Netflix and Pandora, felt like they were tailored for the Nook Tablet. With the original Nook Color, Barnes & Noble's operating system--a variant initially built on the Android 2.2 OS--evolved in keeping with the Nook Tablet's alignment into the bigger tablet universe. The Nook Tablet takes that integration to a higher level, but only for some apps. At launch, the flagship example is Netflix, whose tablet-optimized app and options are accessible from the Nook Tablet's home screen. You can access your Netflix viewing history and recommendations from the home screen and from the home screen's More menu--a convenient and logical move, given the Nook Tablet's aim to embrace its full tablet potential from the get-go, and given that Barnes & Noble lacks the direct digital-storefront tie-ins that Amazon's Kindle Fire offers. Barnes & Noble says that it will announce content partnerships in early 2012; until then, you're limited primarily to streaming services such as Hulu Plus, Netflix, Pandora, and Rhapsody. Granted, you can sideload music and video to the MicroSD card, but the software apps included for playing such files are woefully inadequate for a tablet. 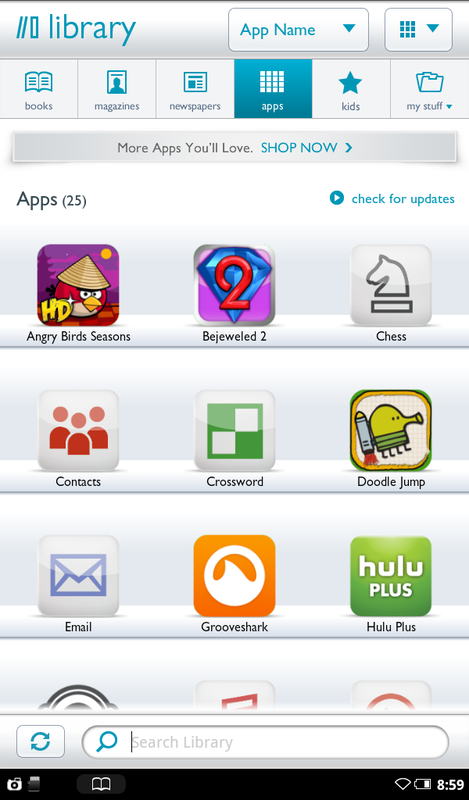 The Nook Tablet's home screen is highly customizable and provides quick access to apps and reading material. As a whole, apps are now treated in much the same way as book and periodical content. You can reach all of them through the recently accessed bar along the bottom of the home screen, and you can pin any of them to the home screen for easy one-tap access. I appreciated that this area didn't get cluttered with specific, recently played video or music selections--as happens on the Kindle Fire. For all of its expansion to embrace apps and multimedia, the Nook Tablet continues to be optimized for reading, as is clear from the display, from the well-designed reading interface for accessing and buying books, and from the tablet's visual presentation of periodicals. Children's books are also presented better here than on the Kindle Fire. The new Read and Record feature in children's books is especially compelling; it worked very well when I tried it. I could create my own audio track to accompany a book, a feature with special appeal for families with a loved one who travels or is far away. I hope we'll see the mic incorporated into other applications. Regrettably, video chat won't be one of those applications, since B&N didn't include a front-facing camera. 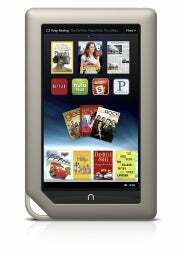 The Nook Tablet is missing such common tablet features as Bluetooth, stereo speakers, a GPS, and front- and rear-facing cameras. The Nook Color omitted those features as well, but considering that the Nook Tablet calls itself a tablet and is trying to compete with tablets, Barnes & Noble should have added at least some of them. Admittedly, some of the "value" competition lacks Google services and cameras, too; but the Nook Tablet's core specs are good enough for it to play in the big kids' sandbox, alongside 7-inch Android Honeycomb tablets from the likes of Samsung and Toshiba. The Nook Tablet would stand up better to the competition if it had added a more competitive feature set. I would also like to have seen B&N step up the display's resolution. B&N's bonded and laminated VividView display qualities significantly improve the display's quality, but in some fonts, I could still see pixelation in the text. I prefer the smooth text rendering of higher-resolution displays, such as those offered by Toshiba's 7” Thrive and T-Mobile's SpringBoard, two Android 3.2 Honeycomb tablets that have raised their display resolution to 1280 by 800 pixels. And even Samsung's Galaxy Tab 7.0 Plus--another Honeycomb tablet, but one that has the same resolution as the Nook Tablet--does a better job of text rendering than the Nook Tablet. Though B&N clearly missed a few opportunities to forge ahead of the 7-inch tablet pack, these omissions were undoubtedly carefully calculated trade-offs necessitated by the need to achieve an attractive price. And attractive it is: At $250, the Nook Tablet is a bargain compared with the Samsung Galaxy Tab 7 Plus (shipping now) and the Thrive 7” (shipping in December), both priced at $399. It's also far cheaper than the SpringBoard ($440 across its two-year contract, plus monthly mobile broadband payments). If you're still wondering whether this model is right for you, see our detailed report on how the Nook Tablet and the Kindle Fire match up across nearly a dozen criteria. The bottom line? Though the Nook Tablet lacks the flexibility of a full-featured tablet, it excels at reading, and it offers a smattering of solid streaming media services. For those reasons alone, the Nook Tablet edges out the Kindle Fire, by a hair. The Kindle Fire, not surprisingly, has tighter integration with Amazon's storefront services, which makes getting music, movies, and TV easier than doing so on the Nook Tablet.